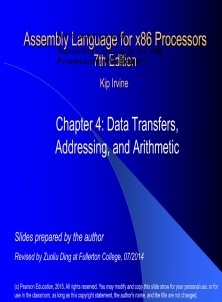 Assembly Language for x86 Processors, 6/e is ideal for undergraduate courses in assembly language programming and introductory courses in computer systems and computer architecture. Written specifically for the Intel/Windows/DOS platform, this complete and fully updated study of assembly language teaches students to write and debug programs at the machine level. Based on the Intel processor family, the text simplifies and demystifies concepts that students need to grasp before they can go on to more advanced computer architecture and operating systems courses. Students put theory into practice through writing software at the machine level, creating a memorable experience that gives them the confidence to work in any OS/machine-oriented environment. Proficiency in one other programming language, preferably Java, C, or C++, is recommended.